Brenda uses a holistic approach to blend yamuna body rolling, yoga and physical therapy. Brenda has been a licensed physical therapist for 24 years. After practicing yoga for many years she completed her yoga teacher training in 2010, and in 2012 she completed her Yamuna body rolling level 2 certification. She has found that by having a regular practice combining these disciplines, many injuries can be prevented or managed independently. Her goal in opening the studio was to give others the opportunity to maintain balance and health in their bodies. If you need extra help or treatment, her physical therapy treatments are always available for you. Maura’s intuitive teaching style blends 18 years of practice and study, an undergraduate degree in psychology with an understanding of Yoga, Yamuna Body Rolling, Thai Bodywork, Reiki and Aromatherapy as therapeutic modalities. Beyond completing her 200 hour teacher training, she studied trauma-sensitive yoga, yin yoga, yoga therapeutics, Yamuna Body Rolling and Thai Bodywork in Chiang Mai, Thailand. Her intention is to offer therapeutic yoga and Yamuna Body Rolling sessions that go beyond instructions, by giving you the tools and understanding to improve your practice, mind-body awareness, and ultimately for you to feel connected to the voice of your soul which we can hear more clearly when we soften awareness inward. Tracey's passion for self-healing, mind-body awareness and natural alternatives led to an unexpected journey toward teaching. Recognizing the positive effects these practices have had on her personally, she felt compelled to share. She completed her 200 hour YTT through Aura Wellness and received her Yin Yoga training under the guidance of Josh Summers. She is in the final stages of completing her Yamuna Body Rolling Phase 2 certification. Tracey often explores the use of essential oils as part of her self-healing. Tania brings over 15 years facilitating groups and individuals in breath embodiment through both her private Integrative Breathwork practice and her group class and workshop teachings in and around Southern Maine with over 6 years as a yoga teacher. Tania’s unique ability as a healing practitioner and teacher is enhanced by her grounded, calm presence and her personal commitment to finding peace in her own life. Her classes and client sessions offer professional expertise in the field of Integrative Breathwork (sometimes referred to as Transformational, Holotropic or Re-Birthing Breathwork) as well as Somatic Breath Therapy- an alternative form of treatment for stress, anxiety, depression, and trauma history as well as Vinyasa and Restorative Yoga and Reiki. Tania has continued studies in the field of breath mastery with the International Breathwork Training Alliance as well as certification in Reiki Level II, and 200 hour Yoga Teaching certification, and has assisted and led numerous sacred ceremonies. With a commitment to bringing a balanced approach to healing and wellness, learn more about Tania by visiting- www.spiraldancebreathwork.com. Cindy's passion for yoga began over 15 years ago. She received her certification with former Anusara teacher and founder of Ashaya Yoga, Todd Norian. She is inspired by her studies with master teachers in the Iyengar, Anusara and Ashaya tradition. Cindy takes great joy in sharing the many healing gifts of yoga. She believes when the mind, body and spirit align and we step into our heart through the practice of yoga, our lives can evolve in a positive way. Anna practices yoga as a way for self-care. She is inspired by how peaceful the practice is, and is drawn to the space yoga and meditation creates for compassion. In receiving her 200hr Fluid Yoga Teacher Certification in the Spring of 2018, Anna focuses on making movement and mindfulness a comfortable and accessible experience for all practitioners. Through teaching yoga, she hopes to help practitioners find a calm, loving, and self-accepting mind set. Sharon has been a yoga teacher for over 24 years, and has a wealth of experience with extensive training with the likes of Patricia Walden, Peentz Dubble, Eric Schiffman, Elaine McGillicuddy. She has studied Yamuna Body Rolling, Feldenkrais, Bodynamics, functional anatomy, developmental movement, Thai yoga massage, energy work, and meditation. Our bodies have stories. When we listen to them, we are empowered to make better choices and as a result feel more life in our bones. My own path to healing has inspired me to use my knowledge to help others, to give the love and generosity I have been given to those who come to me. Meghan grew up in mid coast Maine where she began dancing ballet at the age of three. Through her dance career she was introduced to Pilates as a way of rehabbing her body. She began her Pilates instructor training in West Palm Beach Florida where she worked as an apprentice for a master instructor. Throughout training she worked closely with a Physical Therapist and took extensive courses on Anatomy and Kinesiology. She is certified in Pilates Mat, Pilates Suspension, Pilates Barre, Redcord Suspension, CoreAlign1 and has completed Phase 1 Yamuna Body Rolling teacher training. Her classes have an invigorating& therapeutic feel. 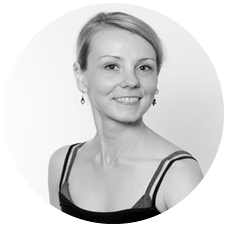 Sarah's teaching style combines her background in medical science with her appreciation of mindfulness. Utilizing a systematic approach to correcting alignment, her classes also focus on mind body connection, emotional healing and releasing physical stress. Sarah provides a safe environment to fully experience the profound physical and emotional effects that you can achieve with Yamuna Body Rolling. Sarah completed her Phase 1 and Phase 2 training here at Willard Beach Studio, studying under Elizabeth Demmel.